How does the Attitude to Risk step in the Recommended Investment Strategy section work? 1. Add multiple ATR records for individual or joint clients, or both. 2. 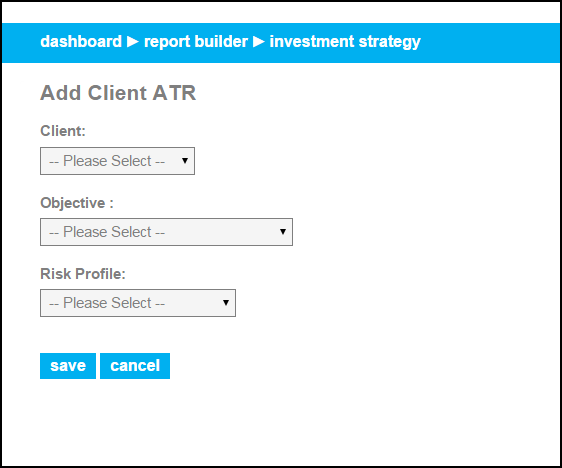 Add multiple ATR records for the same client to cover their different objectives. 3. Specify whether a risk profiling tool has been used to asses the client's attitude to risk. 4. Select which set of attitude to risk profiles you wish to use (and include) within a particular report. On entering the Attitude to Risk step you will notice that we've made some changes to the layout. First up you will now be prompted to confirm whether a risk profiling tool has been used to assess your client's attitude to risk. If it has, you should enter the name of the tool e.g Finametrica Risk Profiler in the text box provided. Next you will be prompted to select which set of attitude to risk profiles you wish to use in that particular report. 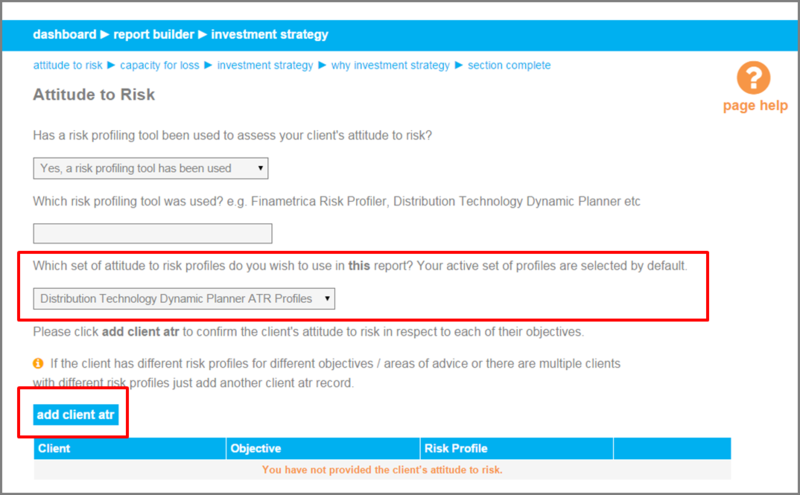 Your account's active set of profiles (as defined in customisation>attitude to risk profiles) will be selected by default. However, you can now override this default selection by simply selecting one of the other sets included in the drop down menu. You will then be prompted to confirm the client's attitude to risk for each of their objectives. Just click the add client atr button and you will be taken off page. 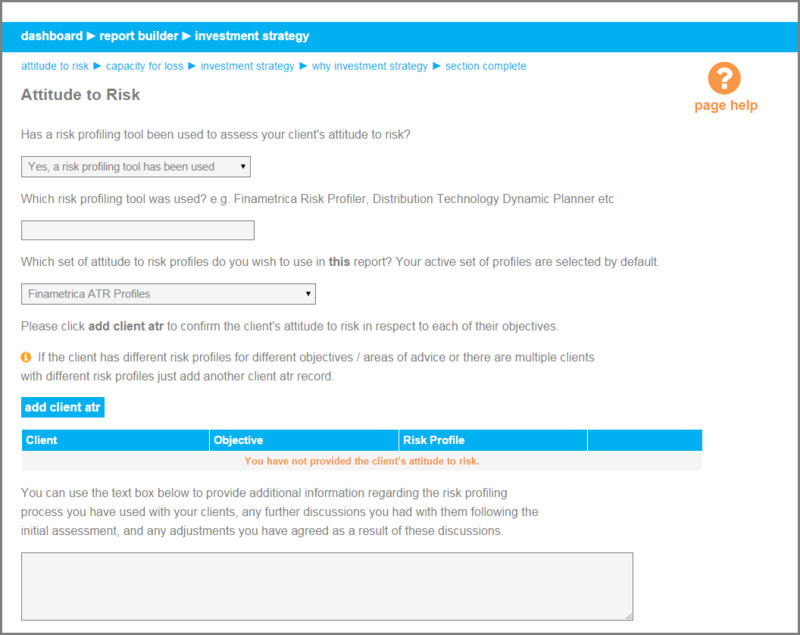 Here you can select the client, the objective and the corresponding risk profile. Click save and you'll be returned to the main step page. Simply repeat this process as many times as required. If there are any other objectives that you'd like to see included within the objective drop down menu just drop us a message and we'll look to get them added. Finally, you can use the text box at the bottom of the page to add any further information regarding the risk profiling process that you wish to include in the report.